I’d like to recognise the work done by the CAMERA team in getting the CAMERA Trial off the ground and flying. It's 6 months since the study started taking enrolments. Recruitment is on target, hospitals in Singapore and Israel have recently joined the multiple sites across Australia. 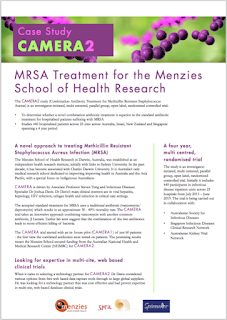 The CAMERA Trial - Combination Antibiotic therapy for Methicillin Resistant Staphylococcus Aureus - is a multi-centre RCT to determine if 7 days of intravenous β-lactam in combination with standard therapy will lead to better complication-free survival 90-days after randomisation, compared to standard therapy alone in adult patients with methicillin-resistant S. aureus (MRSA) bloodstream infection. The case study will become part of a suite of trials coming to our new information rich Spinnaker website later this year.